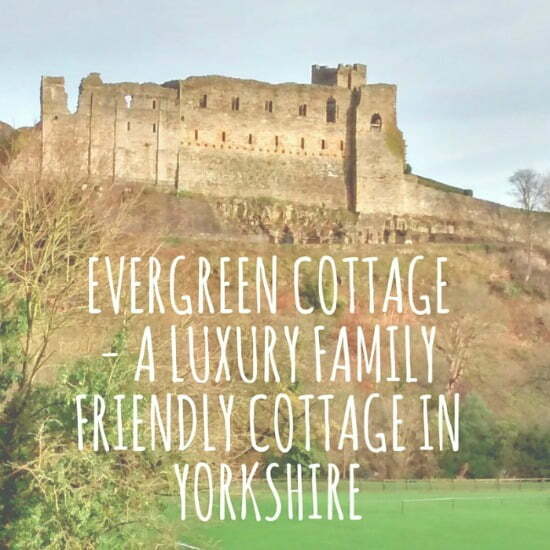 Evergreen cottage is a luxury family friendly cottage on the outskirts of the market town of Richmond in Yorkshire. 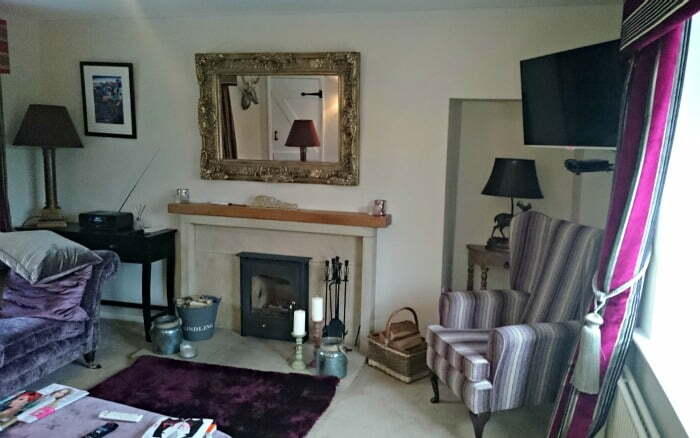 The cottage is exquisitely furnished, and has loads of facilities for younger children making it the perfect base for a family holiday in Yorkshire. The décor and furnishings! The first word you will utter when you arrive at Evergreen Cottage is Wow! 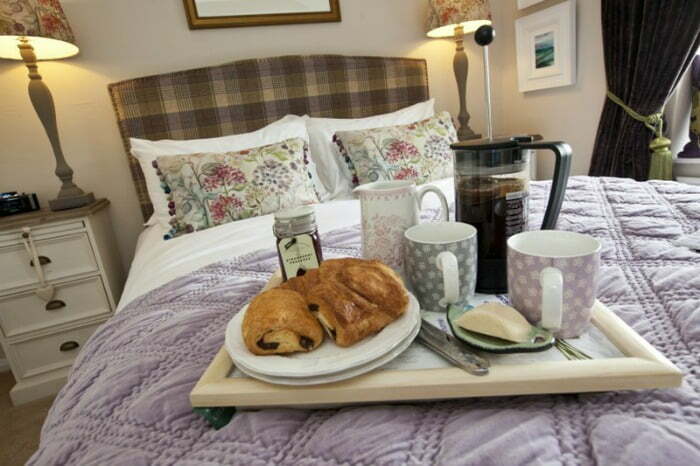 The cottage has been recently refurbished, and the owners have a real creative flair and eye for detail, which is apparent throughout the cottage. The cottage is made for relaxing, and the stresses and strains of daily life will start to leave you as soon arrive in the cottage. The view of Richmond Castle. 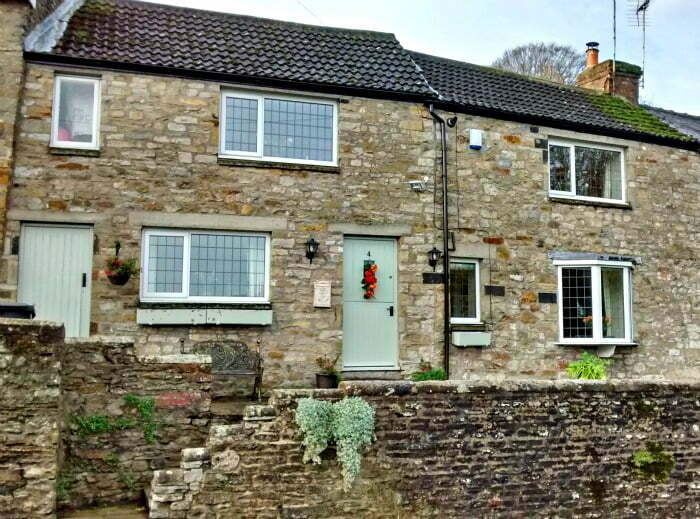 This cottage has amazing views of Richmond Castle and the River Swale – perfect for admiring with a glass of wine after the kids have gone to bed! The Welcome Hamper – The next best thing about Evergreen Cottage is the Welcome Hamper. I’ve stayed at many cottages before where the ‘welcome pack’ has comprised of little more than a pint of milk, but the welcome hamper at Evergreen Cottage was bursting with scrummy Yorkshire produce such as Wensleydale cheese, crackers, organic bread, mince pies and my favourite – Jingle Bells Jam!. It even had some Haribo sweets and chocolate Santas in it for the children! There are 2 spacious bedrooms and a luxurious bathroom upstairs at Evergreen Cottage, and a kitchen / dining room and sitting room downstairs. Outside there is a little garden with a table – perfect for al fresco dining in the summer. 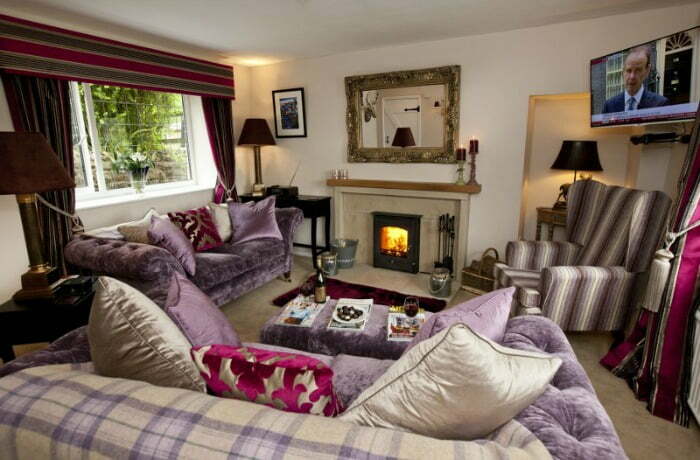 The sitting room has 2 large settees with comfy cushions, stacks of glossy magazines to browse through and a wood burner for keeping the room extra toasty in the winter months. The thick curtains are also perfect for keeping the cool Yorkshire air out and creating a snug in the winter months. There is a Smart LCD TV mounted on the wall, a Blu-ray DVD player, and lots of DVDS to borrow including favourites such as Ice Age and Mrs Doubtfire for the little ones! The walls of the sitting room, and in fact every room in the house, are adorned with quirky art from the local art shops in Richmond town. The kitchen has everything you need and more. Perfectly proportioned, there is a little dining table and an oven, fridge, freezer and washing machine. There is a highchair and plastic cutlery and crockery available for younger children. 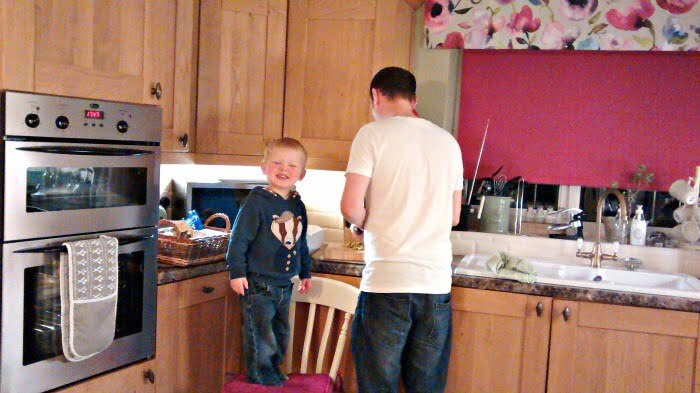 2 year old Daniel doing some cooking in the Evergreen Cottage kitchen! Both bedrooms are extremely light and airy, and have stunning views of Richmond Castle and the surrounding countryside from the large windows. 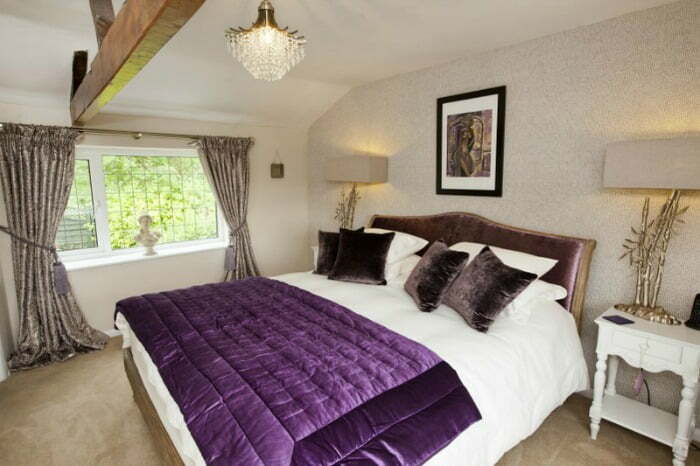 The Master Bedroom has a Superking-size bed with luxury bedlinen and pillows. Again, everything you could possibly need has been thought of here too– there is even a pair of hair straighteners in the Master Bedroom and a Playstation 3 with games in the 2nd bedroom. A travel cot is provided and fits comfortably into the Master Bedroom. The bathroom has a bath and shower and lots of luxury toiletries to pamper yourself during your stay. Evergreen Cottage is in an ideal location to explore the Yorkshire Dales, as well as the market towns of Richmond and Leyburn. Richmond is just a 10 minute walk away and has lots of independent shops, tea rooms and a fantastic market on a Saturday. The town of Leyburn is worth a potter too – foodies will love browsing around Campbells fine food and wines shop. Children will have a fantastic time at the Forbidden Corner near Middleham. This award winning attraction is perfect for children who like being outside – see what surprises you can find in this magical garden! Train lovers will love a ride on the Wensleydale Railway – this departs from the town of Leyburn to Redmire where you can walk to Bolton Castle (30 mins). Cheese fans should pay a visit to the Wensleydale Creamery where you can sample (and buy!) local cheese. A nice spot for a picnic and run around is Easby Abbey just a few miles outside of Richmond. This isn’t very pushchair or buggy friendly, but is fine for toddlers or babies in carriers. The River Swale is a few minutes walk from Evergreen Cottage so is good for a run around too. Further afield, the World Heritage Site of Fountains Abbey is great for a family day out, as is York with the world famous National Railway Museum. The following baby and toddler equipment is provided at Evergreen Cottage. The owners bought a stair gate to put on the stairs, but it didn’t fit so there isn’t a stair gate at the property. There are thick curtains in both bedrooms – no need for blackout blinds! Smart TV with Cbeebies in the 2nd bedroom. Smart TV with Cbeebies in the sitting room. A selection of children’s DVDs. A range of supermarkets deliver online shopping orders to Evergreen Cottage. There is a Coop in Richmond and a Tesco about 7 miles away. There are loads of wonderful independent shops in Richmond. On arrival – a wonderful Welcome Pack awaits you! WIFI – Fibre optic WIFI is provided.